Mining projects in developing countries are increasingly expected to deliver sustainable benefits to local, regional, and national stakeholders. Many governments and companies have been considering the use of foundations, trusts, and funds (FTFs) as vehicles for sharing the benefits of mining operations with the surrounding communities. To achieve sustainable benefits, however, mining FTFs need to be integrated into the local context. With more than 60 mining FTFs operating in the developing world, there is a vast breadth of experience in using these structures to share the benefits of mining. This report has sought to expand the knowledge base around the use of FTFs in the mining sector given the clear demand for additional knowledge and expertise in this field. 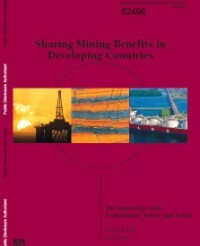 From experiences with corporate philanthropy using FTFs in the United States in the 1930s to the modification of taxation arrangements through FTF structures in Peru in 2007, the mining industry has used FTFs to achieve various goals and to share benefits through royalty payments to governments, compensation payments to affected individuals and communities, and community investment programs. the report download as PDF !